These Raçka (pronounced Rass Ka) sheepskins come from a special breed of Hungarian sheep. 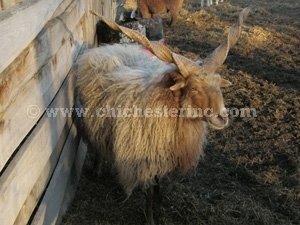 Raçka sheep look like angora goat with unusual spiral-shaped horns. They look like angora goats but their wool is more sheep-like and softer. Their wool is long and appears in two general types: a cream wool with light brown faces and legs, and a black variation. We sort our sheepskins into three colors: creamy white, black, and gray. There is some variation within each color. The Hungarian woman we buy the raçka from believes there are only about 1,000 racka available each year. She only tans 200 to 300 per year. 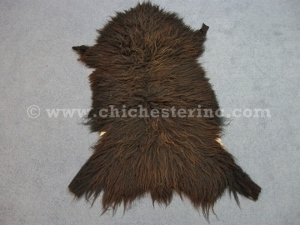 We select just the best quality hides for our customers. In 2015 we were able to get 65 nice hides for stock in the U.S. and Canada. The raçka have a distinctive look. I like to refer to them as Rastafarian hides. The long, matted curls remind me of dreadlocks. It’s not a lock for everyone, but is special for someone who wants something out of the ordinary. The hides are nicely tanned on the hide side and are soft and supple. The woman we get these from does very high quality work. The hides are alum tanned. These hides are used to make Hungarian Suba coats. Our Gxx codes denote individual sheepskins. 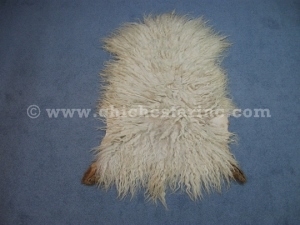 If you would like to order a specific raçka sheepskin, please go to our Gallery to pick the exact one shown. Racka sheeps are not an endangered species and are not subject to CITES controls.